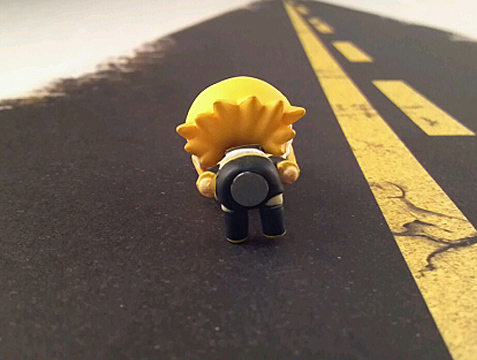 If you have ever felt like you work to hard for to little, or maybe like you aren’t getting treated the way you should be, you may need your very own road roller. 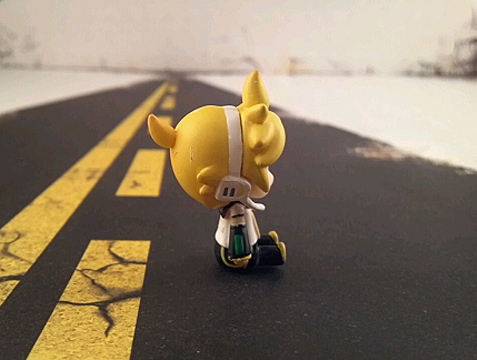 The Kagamine twins know how you feel. After being adopted by their new owner, and forced to sing with no snacks, they are out for revenge! 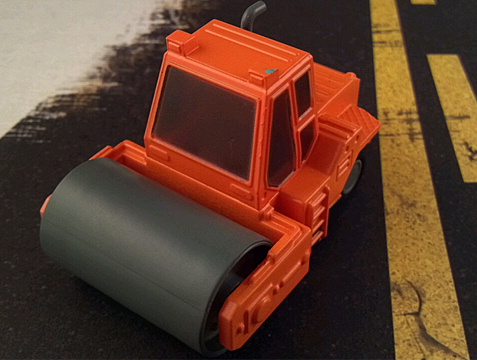 The road rollers are little pull back cars. You tug them backwards across a flat surface, let them go, and weeee off they go! At least they take off if they have a driver. If you remove the driver, the roller will not move no matter how many times you pull it back. Drop them back on, and there they go. Each roller is really simple in detail. There are knobs, vents, and buttons, but none of them are painted. The windows are vaguely transparent. I am not sure exactly why the driver is outside of the cab. Maybe they are just following Hexus’ lead of piloting machinery from the outside. The roller on the front turns, but the vehicle is actually pushed by the rear tires. 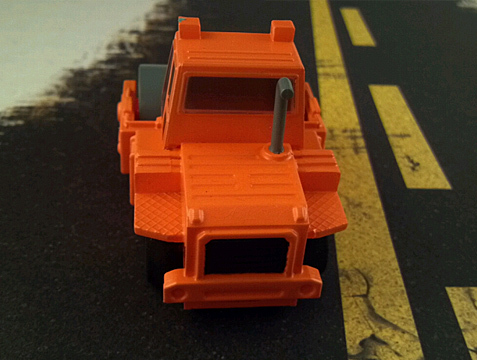 The rear of the road roller has a black vent, and a grey exhaust pipe. (That apparently blows directly into the drivers face?) The seat has a magnet hidden underneath to keep your little driver aboard. I think this magnet is the start mechanism as well. 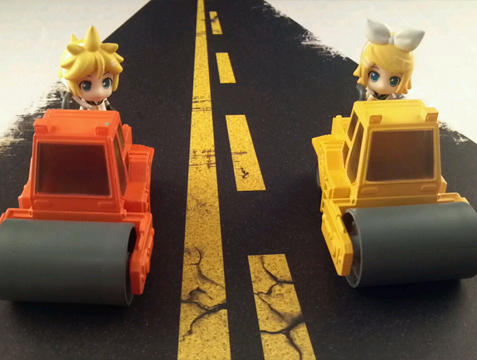 Each twin has their own respective colour road roller. 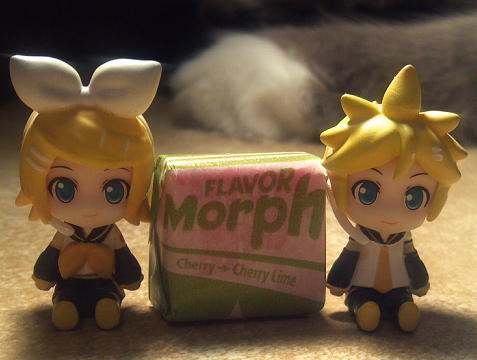 Len has the orange one…. 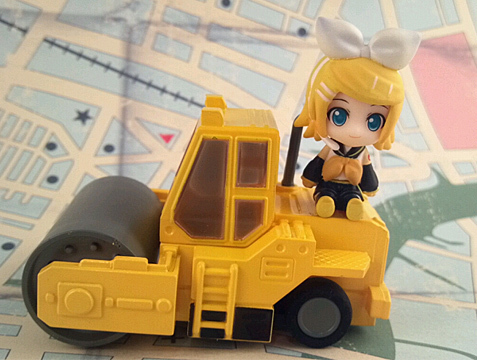 And Rin has the yellow one. Wait shouldn’t that be the other way around? 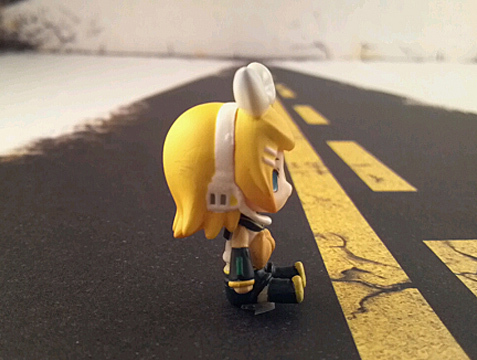 Rin’s item is an orange, and Len’s is a banana after all. Oh well…. The little figures can be displayed separately, but keep in mind they are tiny. I took a picture of them with a Starburst, just for giggles. They are so cute! 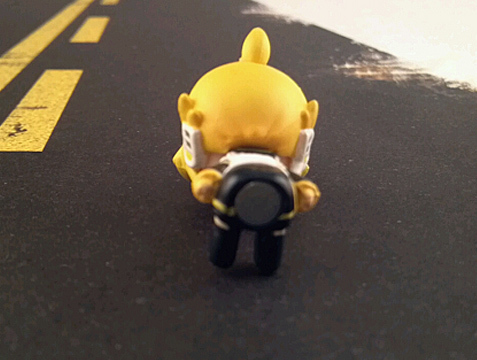 At just about an inch tall, each tiny figure stays true to the characters basic design. 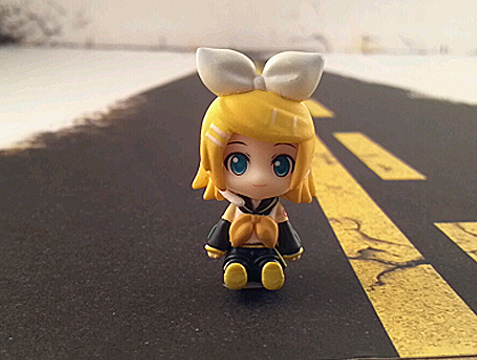 Rin has her hairclips, though they are just little painted lines. She has the number 02 on her left arm, as well as the green digital screens on her sleeves. Her face is super cute! Her paint job is sloppy to say the least, and the finer details are missing. Her belt has no orange on it, and her Treble Clef is missing from her collar, but for such a tiny figure these details can be overlooked. 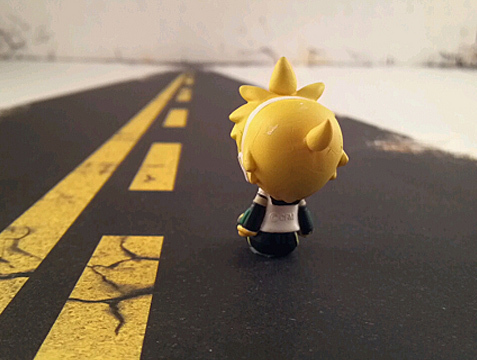 The back of her head has little to offer in sculpt, and has some strange scuff marks on the right sideof her hair. 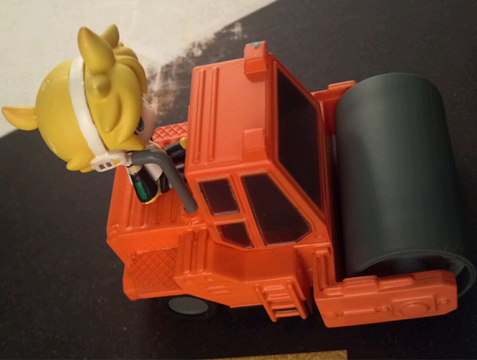 She also has a magnet in her fanny that serves as the key to her road roller. 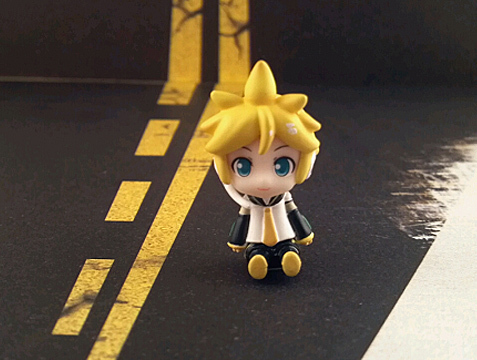 Len is just as cute, but lacking in just as much detail. I honestly think their faces look really great all things considered. His Spiky bangs look good, and so does his little neck tie. They added a couple flecks of white paint to his hair. I think this is supposed t make it look shiny? His paint is kind of sloppy too, but like Rin he has his green screens, and his belt strap. He is missing his Bass Clef on his collar, and the orange on his belt strap. He also has some weird marks on the back of his head. His tiny ponytail is sooo cute! 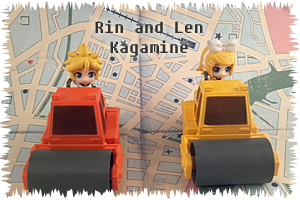 Len also has a magnet on his hiny to keep him on his road roller. 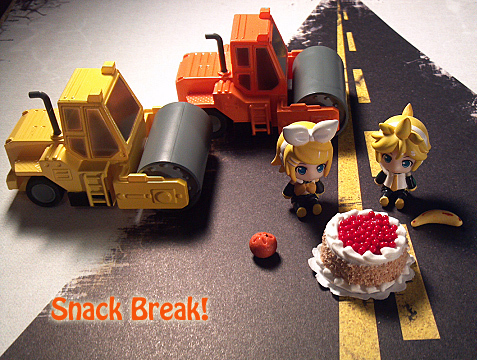 I made sure to give the twins snacks, so I won’t become the next victim of these road rollers. Adopt at your own risk!! Fun innovative idea in pull-back cars. The quality of the figures is questionable. I am a crazy anime fangirl. I love music, movies, and video games. I frequently attend concerts, and conventions. I make all my own cosplay. (Which is a work in progress) My biggest hobby however is collecting solid tangible things. Cds, dvds, figures of all shapes and sizes, cards, and any other random related goods. 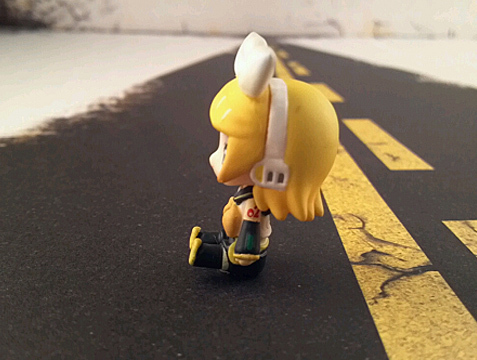 This entry was posted in Anime Figures, Complete Figures and tagged blue eyes, FREEing, Good Smile Company, Len Kagamine, Rin Kagamine, Road Roller, Vocaloid, Yellow Hair. Bookmark the permalink.